Apple typically offers three different CPU upgrades in its portable Macs: the base CPU, one that comes with the upgraded SKU and a third BTO option that's even faster. 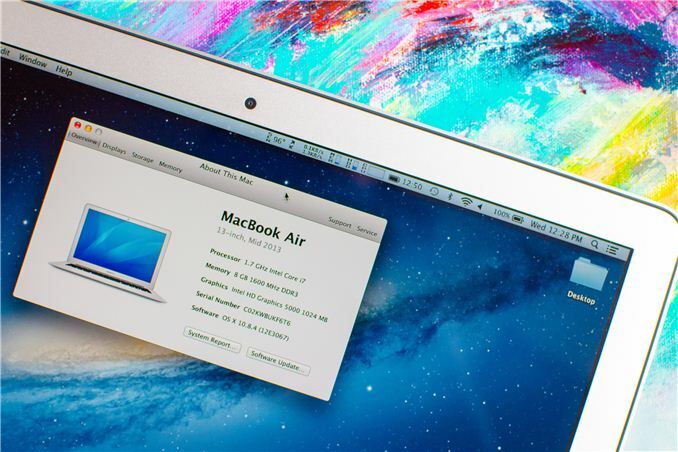 In the case of the 2013 MacBook Air, Apple only offered two: a standard SKU (Core i5-4250U) and a BTO-only upgrade (Core i7-4650U). As we found in our initial review of the 2013 MacBook Air, the default Core i5 option ranged between substantially slower than last year's model to a hair quicker. The explanation was simple: with a lower base clock (1.3GHz), a lower TDP (15W vs. 17W) and more components sharing that TDP (CPU/GPU/PCH vs. just CPU/GPU), the default Core i5 CPU couldn't always keep up with last year's CPU. Careful binning makes all of this possible within the same TDP and cooling solution as the standard configuration. The CPU upgrade comes at a fairly reasonable cost: $150 regardless of configuration. The max clocks increase by almost 30%, as does the size of the L3 cache. The obvious questions are how all of this impacts performance, battery life and thermals. Finally equipped with a 13-inch MBA with the i7-4650U upgrade, I can now answer those questions. The two systems are configured almost identically, although the i7-4650U configuration includes 8GB of memory instead of 4GB. Thankfully none of my tests show substantial scaling with memory capacity beyond 4GB so that shouldn't be a huge deal. Both SSDs are the same Samsung PCIe based solution. Let's start with performance.